That was not an idle promise. Since taking office, Evers has endeavored to renew Wisconsin’s historic commitment to worker rights. Last week, he announced an ambitious plan to overturn the noxious “Right-to-Work” legislation and assaults on prevailing-wage protections that were a centerpiece of Walker’s second-term agenda. After Walker crashed and burned as a contender for higher office, he announced that, instead of the presidency, he really wanted another term as governor. But Evers, the state’s longtime Superintendent of Public Instruction, objected. Evers mounted a campaign that highlighted the damage done to the state by Walker’s implementation of policies that were popular with the Koch brothers — cuts to education and public services, assaults on the environment, giveaways to multinational corporations — but that made no sense for working Wisconsinites. Evers won, as did every other Wisconsin Democrat who was running for statewide office in 2018. But replacing Walker was only step one. 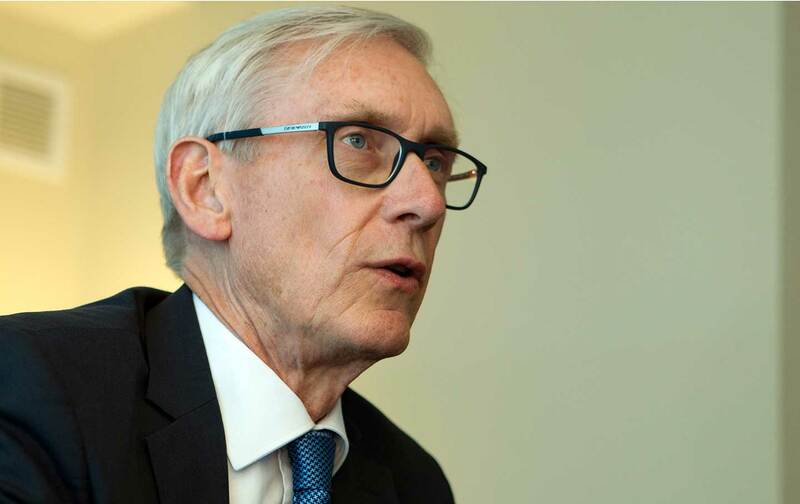 Now, two months into his governorship, Evers is focused on step two: replacing the special interest-dictated program that discarded Wisconsin’s traditional Main Street Republicanism–as exemplified by former Governor Tommy Thompson–in favor of the cruel politics of Walkerism. In the ambitious “people’s budget” that Evers unveiled last week, the new governor pointed, at virtually every turn, in a different direction from where Walker was headed. Evers is trying to get Wisconsin focused on meeting the 21st-century challenges that went unaddressed during his predecessor’s reactionary tenure. When he delivered the budget to the legislature Thursday, Evers tapped into a sense of urgency about moving forward. Governor Evers’s first budget address was a home run derby! Worker rights issues have to be a part of every serious discussion of the future. Globalization, a digital revolution that is already here and an automation revolution that is rapidly arriving are reshaping our work life and our home life in radical ways. Any program for reclaiming a proper balance must, necessarily, involve the renewal of unions (which will themselves need to adapt to the changing times). Walker’s determination to erect structural barriers to organizing strong unions, and to render collective bargaining virtually meaningless, moved Wisconsin in precisely the wrong direction. So when Evers proposes to take those barriers down, by overturning the state’s “Right-to-Work” law and restoring prevailing-wage protections, he is not just undoing Walkerism. He is talking about getting ready for the future. Needless to say, there will be resistance to a future in which organized labor gives workers a meaningful say on the job and, perhaps more significantly, in society. This resistance will be evident throughout the budget debate in Wisconsin, where the gerrymandering of legislative district lines and the obliteration of campaign finance rules has allowed Walker-aligned Republicans to retain control of the state Assembly and the state Senate. Evers has a fight on his hands. The Republicans will not bend easily to an agenda that would reverse their “Right-to-Work” legislation. And it will be even uglier when Evers attempts — as he eventually must — to upend Walker’s destructive Act 10 legislation, which was designed to gut collective bargaining rights for public-sector workers and their unions. All of the progressive proposals that Evers is advancing will face intense opposition from conservative legislators who imagine that his defeat of Walker was a fluke. But the struggle to renew and extend worker rights and to allow for the organizing of strong, forward-looking unions is no fluke. It’s the fight for an equitable future and the “better version of democracy” that must come.